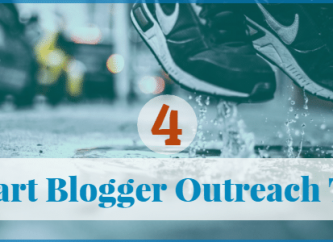 When you’re just starting out with no contacts or support group to back you up, cold email outreach is one of the most reliable ways to build your customer base. Take Nathan Barry, for example. As the founder of ConvertKit, an email marketing platform, he was able to grow his company to $900,000 monthly recurring revenue by sending cold emails to professional bloggers (and he is still doing that -- that’s how powerful this strategy has proven to be for him). But people typically see a very low open and response rate from cold emails. I would say that the typical reply rate is 1-2%. That is, out of 100 cold email recipients, only 1 or 2 would reply, and even then, those responses don’t necessarily lead to conversions. This is why many people typically avoid cold email strategies. Here’s where this guide can help you. If you want to do a successful cold email outreach campaign (just like any other kind of campaign), you need to have a strategy in place. There are certain steps to cold email that have proven to be the most effective. Follow along and you’ll find a step-by-step strategy that has worked for many A-list cold emailing experts. The first mistake you could make when doing a cold email outreach campaign is sending your email to the wrong person. Sending a pitch for a company-wide health insurance package to an IT manager is probably not going to have your desired impact. Now depending on what you’re offering in your emails, the person you should target is different. If you know who exactly to target, like the editor or owner of a blog, you’re all set, but if you’re selling to a large company and you don’t know the ideal person, you need to look for a specific role that’s responsible for acquiring your product or service. Look for the roles related to your product. For example, if you’re selling a sales-related product -- like a sales management platform -- you should contact a sales manager or director. If you’re reaching out to offer your copywriting services, it’s a good idea to contact the content manager, rather than the CEO. If you’re targeting a small company or startup, the right decision maker is likely the CEO. So, unless you find a different director or manager responsible for a section -- like a content marketing manager or social media manager -- you can confidently reach out to the CEO. 0-10 employees: The decision maker is usually the CEO unless the company has co-founders in the vertical you’re selling into (e.g., CTO for Product, CMO for Marketing) or has experienced VPs. 500+ employees: Find regional, specialized roles, such as East Coast Rep, North America Rep, New York City Rep, etc. After you’ve identified the role you want to contact, you can check out their company’s website to find the page that introduces their team. If you didn’t have any luck there, try searching their company in LinkedIn or Crunchbase to find the suitable role. You will probably find the specific role using these methods. After you found the right person to contact, it’s time to find their email address. 1. Search for the company’s website. In many cases, each role’s email address is included there. The next step is checking out LinkedIn. Many people include their emails in the “Contact and Personal Info” section. If you’re lucky, you can find their email address or their personal website there. Other social media networks might work too but as Tony Restell aptly explains, social media is rather a marathon than a sprint -- you need to build a good relationship with people before asking for an email address. 2. Use NinjaOutreach’s email finder. Enter the person’s name and company domain to find the corporate email. Or, you can enter a domain and see all emails associated with that domain. 3. Alternatively, check if they posted their email address on the “Contact and Personal Info” section on LinkedIn. 5. Once you find a valid combination, use a Chrome extension called Sales Navigator by LinkedIn to find out if an email address is associated with that LinkedIn account. At this point, it’s time to figure out a cold email subject line that will get their attention. To do that, you need to keep these some things in mind. Be relevant: Cite an article they’ve written, a person you both know, any new projects their company is working on, or a problem they’re facing (and how to solve it). This will make your cold email subject line more relevant. 2. Use your industry’s hottest news: If a personality, product, number, or practice is trending in your industry, use it in your cold email subject line. It will pique the receiver's interest and get a click. There is an insidious trend in email marketing that has been creeping up lately, and it’s a reputation-ruining mistake that a lot of people (even established marketers) make: clickbait cold email subject lines. In other words, email marketers trick their recipients into opening their cold emails with gimmicky subject lines that only end up frustrating the receiver. What is a cold email subject line? Deceptive about the urgency of a message: “Urgent -- Update your information.” You click on it just to find it’s a promotional email. How do you personalize your cold email copy? Research your recipient well by visiting his social media feed and his website. Read his content, and check if they’ve been mentioned in the news or achieved something amazing. Research their (current and past) position in the company, find out who they’ve worked with and the challenges they’ve faced. Research the company. Find out the big challenges they’re facing and their recent achievements. 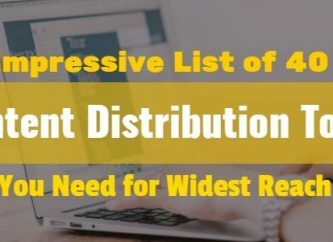 Read their press releases or any articles they’ve published on reputable blogs, etc. NinjaOutreach’s Chrome Extension helps to do this kind of research more efficiently. As you browse the web and stumble upon potential contacts or some important information about them, you can use the NinjaOutreach extension to view their SEO and social data. The extension also automatically crawls for emails and other contact info. As you evaluate leads on the go, you can add them to a specific list and update their data in your database, or click the contact tab and go straight to outreach. After you’ve done your homework on your target lead, be sure to connect your pitch with this information to make it personal. For example, you can start by praising your lead for his/her recent achievements, then talk about the specific issues you’ve found (from your research) that he/she might be facing and offer your solution. When offering your solution (or benefit), don’t overwhelm them. Many cold emails go unanswered because they leave the receiver in decision paralysis. To avoid this, identify a single problem and offer your solution. An effective core benefit transforms the receiver's current self into a desired self. As Consulting.com explains, people are extremely driven by the desire to be transformed from their current self to an ideal self. Prove yourself credible by citing relevant experience and clients that you’ve helped. What questions should you ask in your cold email? “Would this be a problem for you?” Assuming you’ve explained a possible problem they’re facing—such as having too many cold leads—in your sales pitch, ask this question to ensure you’re on the same page. “Interested in a free demo of how our platform can [cite the benefit]?” You’ve identified their problem and offered your platform as a solution. This is the most risk-free, benefit-loaded question you can ask. Once you receive a “Yes,” discuss if they prefer the demo to be delivered in person or online. Sometimes, it’s not your fault that your emails have gone unnoticed. According to the most recent Email Statistics Report by Radicati Group, an average business person receives 97 business emails and sends 43 of them per day. A lot of inbox activity right? The best way to deal with this issue is by sending follow-up emails. You might want to send a follow-up email a week after you didn’t hear from your recipient, then send another one two weeks later, then send one after a month, and maybe some months later. This way, you can ensure that your emails will get noticed. 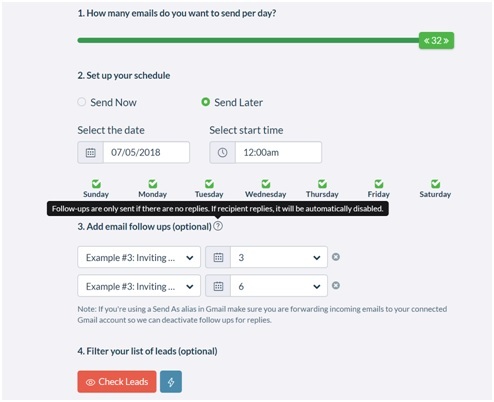 With the email marketing tool NinjaOutreach,, for example, you can automatically launch email outreach campaigns and even set logic rules to automate when a follow-up email should be sent. As you’ll see in the image below, you can set a follow-up to go out on a certain date, time, or after X number of days. Cold email outreach should not necessarily be difficult or frustrating. I’ve already given you a simple, 4-part formula to start your next cold email outreach campaign with. 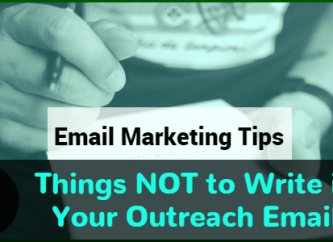 These tips have stood the test of time in my years of practicing cold email outreach, so I recommend that you try it out, and see for yourself. Mostafa Dastras has written for some important companies such as HubSpot, WordStream, SmartInsights, and MarketingProfs. What keeps him up at nights is how he can help his clients increase sales with no BS content marketing (or how people can grow an email list ). Visit his blog, LiveaBusinessLifet , or connect with him on LinkedIn to get him to write for you.